My littlest has always been the one with ants in her pants. Never a quiet moment (or dull one:) with her around. I always wondered if she would ever be able to sit still, and concentrate for longer than 5 minutes at a time. When she turned 4 we went for the usual check up, including an eye test. She couldn't see a thing (astigmatism). I cried my eyes out, as I felt so bad that my baby couldn't see for 4 years. She was quick to pick up on it, and told us she couldnt help tidy up as she clearly couldn't see. Smart. Well yesterday we got her glasses, and the little lady was all smiles. She even got herself a pet dog, with glasses too. The future looks bright - and now she can see it. 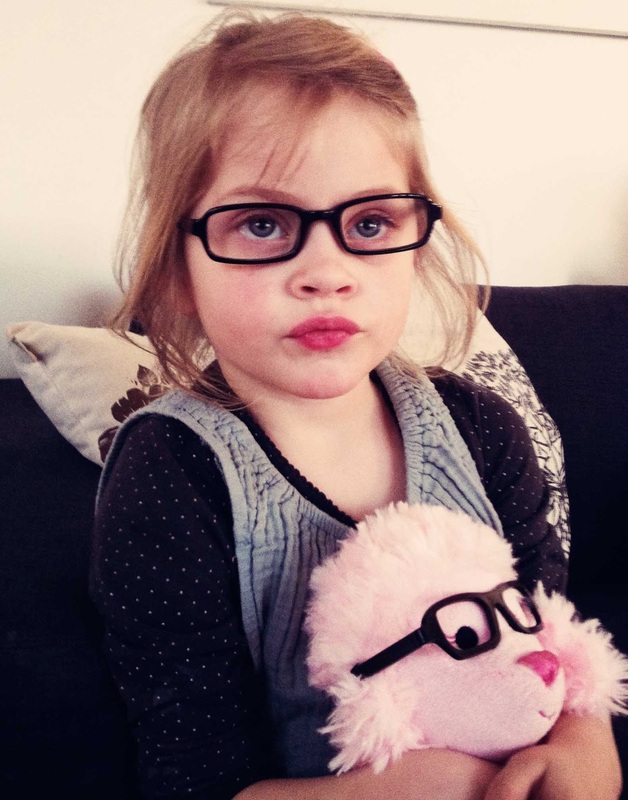 Have any of you got experience with children and eyeglasses? Perhaps you even had glasses yourself as a child? sooooo cute- i'm in love! Hi!!! I am an optician myself. I am not practicing but when I used to, we used to show kids fun people with glasses. Like Harry Potter. The idea is not to go directly and tell them....just make it natural. Casually let books or magazines of people that she admires and wear glasses. As well if you also see it yourself as something casual and fun, she will take after you. Glasses are an accessory, just like a bag or jewellery, in fact there is actually people who would come to my shop to buy glasses without a prescription. Just transparent glasses for the looks. For the summer make sure she has a pair of sunglasses with the prescription she needs. Most parents aren't advised that you can actually buy the pair of sunglasses you love and order lenses with the prescription. Basically custom made the lenses for your needs. I hope this makes sense, English is not my first language. It is awfull to see a kid playing in the bright sun with her daily glasses. I LOVE HER IN GLASSES, and the dog!!! THAT is exactly the way to go. She looks fabulous and I'm sure the little midget tricked you by always compensating the lack of view with an over the roof imagination and attention... I remember her staring at the "big" girls dancing... she wasn't not seeing! At all. She looks fabulous, and sweeter, and will be the envy of your grown ups visitors (we never grew up of wishing to have worn glasses ahahaha ;)) who are already googling to know where you came up with the amazing poodle. She looks the Smart Fairy now ahahahah. Stop crying and put the rollers (and wings) on... if with bad eyesight she ran, now seeing well and beyond there's no stopping her ahahahah and she still can’t tidy her room, glasses my fall and broken ;). Take Care and “you’ll survive MUM”! oh anya, this made me cry. i am so happy for her. i could see, but my eyes became very blurry in 1st grade. i couldn't see the board at school. i've been wearing glasses and contacts ever since. it truly makes a difference. her glasses look so cute. we didn't have much of a choice when i was growing up. those dreadful blue ones. i love her little doll. so happy for the both of you. Oh Anya, so sweet. It's okay, she's got the glasses it'a all up hill from here. :) My oldest daughter had to get glasses a year ago. I was surprised as my husband and I didn't have them until we were older, after high school. But, we eventually had lasic eye surgery. She looks super cute. What a doll she is. I know how she felt, my world changed with glasses! That´s great - and the dog is too cute! Yes, imagine what a change it must be! Pretty girl - pretty glasses! The thing I remember most about the day I got glasses was the leaves. Suddenly there was no longer this fuzzy green mass on the trees. I could see every single leaf and I was completely awestruck. That feeling has stayed with me for nearly 40 years. Wish they'd been cute glasses like these though. No such luck back then :-) She looks fabulous! 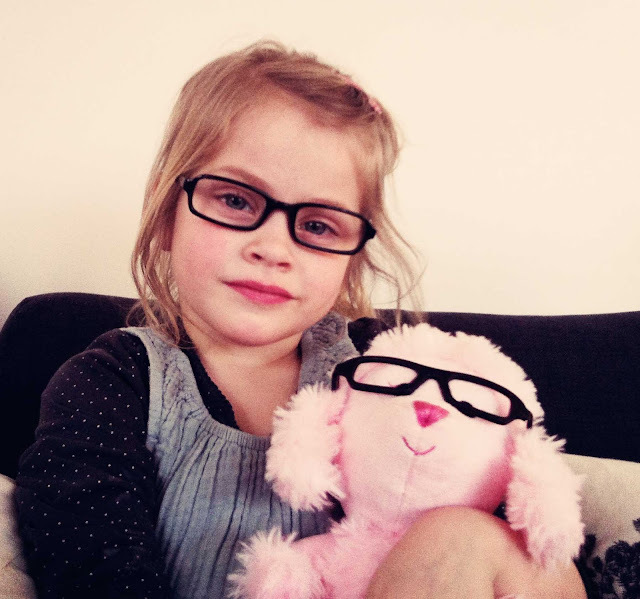 BTW- I just saw this adorable shop that's all about kids w/glasses mentioned on a German blog and thought you might be interested: http://www.barnmedbriller.dk/da/shop.html I love the bunnies w/glasses, lol!